During device opening internal chips are enabled and configured. This results in consumption increases, specially when the 100 MHz clock (PLL) is started. The needed current increases from 100mA to 500mA. In case the USB can't provide enough current the voltage drops below the minimal required for the device to operate and communication fails. - Try to use different USB cable and computer plug. - Use the USB plug on the back of the PC, not the one on the front panel. - Use short cable, do not use long cable or cable extender. - Use powered USB-hub, avoid un-powered hub. - Use USB-Y cable to load power from two plugs. - Connect the device directly to the computer's USB plug without using external hub. - Reinstall WaveForms, including the Adept Runtime section. Use the "My device is not listed" button in WaveForms application Device Manager to reprogram the EEPROM. The USB driver is not installed. Device not identified or malfunction. See "Nothing shows up". The device or its plug might be damaged. In virtual machine options try to disable USB 2.0 support, at least this helps me when using VirtualBox. I'm using 15' MacBookPro too with dual boot to OS-X and Windows using Boot Camp, and Analog Discovery is working well. The left side USB port on 13' MacBookPro seem to provide insufficient power. I was getting “Device configuration failed (PLL 1)" error. I tried different things. finally, I disconnected the cables and rebooted the laptop - that fixed the problem. I just got the device and after plugging in the USB cable windows told me it was updating the firmware on it. I tried to stop it but couldn't. I open waveforms and see the device and chose "Select"
please check usb cable connections. Communication after programming failed or image device id is wrong"
I was so much looking forward to use the analog discovery and this start up problems really kills it. When connecting the device probably it was looking for driver update. The device should work with the provided driver as well with the one found by update. Having the device plugged, in Windows Device Manager under USB controller, select USB Serial Controller and try Update Driver software. As the device configuration is programmed the consumption increases a bit and having insufficient power could cause error. - Try USB 2.0 plug of your computer or try using USB 2.0 hub. What is the model of your computer/laptop and which Windows version are you using? I did get it to work on my friends computer. But i did try all USB connections and a different shorter cable then the one supplied with analog discovery. Maybe the problem is due to me using a macbook. With a windows virtual machine? Waveforms is unable to detect the analog discovery 2. I'm prompted with "No device detected." dialog. Current system: Mac OS X 10.10, Waveforms 3.1.5, driver is installed, USB cable is connected directly to laptop (not running in a VM). Any suggestion as to why this is happening? Please try restarting the Mac without the AD2 connected, try using another USB port or USB hub. Let me know if it is working or you need further assistance. I have the AD2 and it was working great until now. I plugged it in as normal and it didn't light up nor was it detected. I have tried different cables, ports, and other computers. Nothing seems to work. I need help as soon as possible with this, as it is for class. Could you provide more information ? Which OS are you using ? 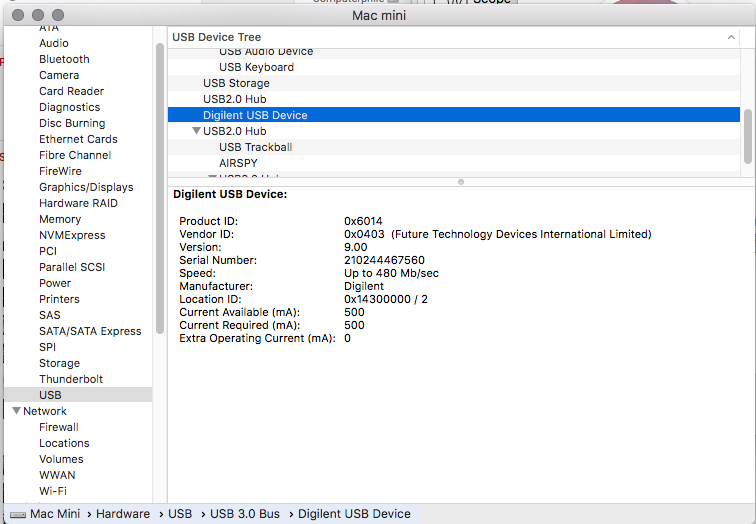 Do you see "USB Serial Converter" appearing in Windows Device Manager ? If the driver version is good, probably some other application did overwrite the EEPROM content. Try reprogramming it using the application I sent you in private message. Could I get the program too? Our AD kit doesn't show up on the computer at all. It did once, after it started giving us trouble, but Waveforms 2015 would end abruptly after about 2 seconds of starting the waveform generators. Does "USB Serial Converter" or any other device show up in Windows Device Manager when connecting the AD ? I did all the troubleshooting techniques in the thread and I am still getting the error "Device configuration failed". I am attaching the error message with this email. Is there anything further the customer could try? The error message they refer to is available on our Gallery here. Since the connection to the device gets to the PLL configuration it is unlikely to be a hardware problem. It rather seems to be a powering issue, supply limitation from computer, bad cable or broken USB plug (in case it is an Analog Discovery 1). Make sure there is nothing connected to the device, try using powered USB hub and a short phone charger like cable, try with the latest WaveForms 2015. I have been adviced to make contact to you about my problem with analog discovery by one of my teachers. Device configuration failed (PLL 3). 2. When i somehow sometimes manage to get through the configuration phase, Waveforms simply tells me that "The Analog Discovery has stopped working due to an overcurrent condition" - even though i haven't connected it to anything at all. 3. All the time i am let through to the Digilent Waveforms menu, there is a flashing message in the bottom right corner saying "Discovery OFF". I do of course have screenshots of all three issues, but it seems like i cannot attach them here. For troubleshooting i have tried using different USB ports on my PC - and even tried connecting the Analog Discovery to different Computers, where other Analog Discoveries were working, but nothing seemed to be able to solve the problem - my Analog Discovery gave the same error messages everywhere. I also tried the provided troubleshooting steps and restart the analog etc. I hope that you can help me! I'm not familiar with this error, so I don't personally have any recommendations, but I'll make sure the appropriate engineer see's your question. You can post any screenshots that you have though on our Forum Gallery (you'll need to create an album). It seems the device does not get enough power or something is damaged in it which consumes too much after the device clocking is started. You could try using a powered USB hub. In case it is still not working please contact the support for warranty and replacement. Two different Macs, Mini and Macbook Pro. 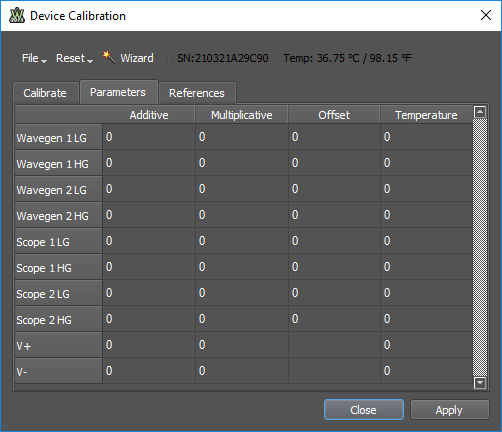 Both see the USB device in the System Report under USB but when Waveforms 2015 (latest version downloaded today) opens the device is not detected. I've tried various lengths of USB cable and directly into the USB ports as well as through a powered USB hub. Following up my problem above. I installed Waveforms on a Windows laptop plugged in the AD and found it worked, moved it back to the two Macs and it worked. I'm not sure if the firmware upload on the Mac's broke it but I'm up and running now. In case a device is not working try to reconnect it or restart the computer having this detached. For some reason my AD2 device stopped working today after a few months of good service. The board is powered via and external DC 5V/1.2A power supply and it is plugged into a USB socket at the back of my PC. I tried to connect it to two different PCs and tried to restart them both with the board disconnected. In the last picture, since the USB voltage and current is read from the device, the fpga gets programmed and communication with this and power monitors is working. Following this, as the other ICs are started most probably runs out of power, internal voltages drop and components are reset, communication is lost or incorrect. In the first pictures it seems that in the first stage of connection, during the fpga programming runs out of power. The USB controlled is directly powered from USB line, so this remains connected to the PC. The loss of power could be because of USB cabling, to high resistance on cable or oxidized plugs. The unprogrammed device gets power parallely from USB and auxiliary supply. When connecting to the device with software, after the device fpga is programmed and this sees auxiliary supply it turns off the USB supply switch. In case the aux supply can't provide enough power the device is reset. Please try to not to use auxiliary supply, try to use a different USB cable and/or powered hub. We recommend using 5V/2A supply, mostly because the increased capability of the power supplies. We've purchased 6 boards in total so far and it's just this one board which gives us a bit of grief, all other boards are working fine. Is there a chance that we can replace that board somehow as this issue is blocking our testing at the moment? Thanks! Since you have other devices that are working we can exclude cabling other external problems. It is most likely the device is damaged. The 5V auxiliary supply should be protected for reverse polarity and up to 20V, scope inputs up to 50V, digital IOs 20V... Could it happen that device was connected to voltages or external sources exceeding any of these? The AD ground is connected to computer ground through the USB cable. The earth/ground of different socket plugs could be wrongly wired and have high voltage difference. Connecting together circuits/equipment supplied from such plugs could blow up fuses, in case of AD the ferrites or protection diode toward the USB VCC/GND. Could it happen that the device ground was connected to another voltage level that the computer ground? For warranty and replacement please contact support_at_digilentinc.com specifying the Date of Purchase, Seller and Purchase Order/ Web order Number. 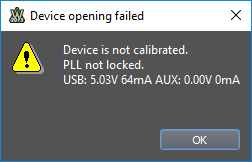 No, this device wasn't connected to voltages exceeding these values. Not sure I understand the question, but this board was always connected to USB port either on my personal PC or on our test server PC. I was referring that connecting the ground wire of the AD device to a different voltage level (like to an external circuit which is supplied from a different source and grounding) could cause high current to pass the ground line toward the computer. This could burn the ferrite or protection diode in the AD.